Backing onto the ASCTA Convention 2013 in Australia, the opportunity was taken to get IFSTA CEO Roger Millward and STA Operations Director Theo Millward together with IFSTA Asia-Pacific Region Members to share ideas and update on developments. IFSTA Asia-Pacific Region President Ross Gage chaired the Meeting, which included Malaysia’s May Ang Seok Leng and Bernard Chang, Singapore’s Foo Chee Han and Kin Choon Nah, and Australia’s David Speechley. Much discussion focused on teaching learners with disabilities and getting ‘seniors’ into swimming and water-based exercise. Roger updated the group on the newly enhanced IFSTA website, whilst Theo showed a first-class course enrolment protocol that he has lead the development of. 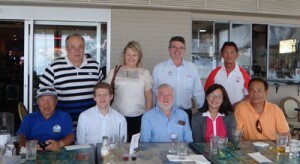 The Meeting ended with further networking over lunch (pictured) at the Kurrawa Surf Lifesaving Club.